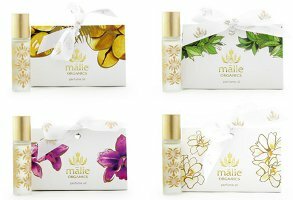 Malie Organics has launched a new line of organic roll-on perfume oils, in six fragrances that "reveal the natural bounty of Hawaii". Coconut vanilla ~ "This blend of coconut and vanilla is a heavenly, full-bodied scent that fills the atmosphere with a relaxing aroma." Koke'e ~ "This scent was named in honor of Hawaii's oldest rainforest and captures the crisp, green, refreshing scent of the native maile vine (pronounded my-lee)." Mango nectar ~ "Experience the sweet scent of summer year round. Known for being high in antioxidants, mangos give this perfume a sweet, tropical scent." Orchid ~ "A tribute to Orchid lovers around the world who covet the delicate, feminine aroma of these rare and exotic flowers. Leaves behind a warm, subtle scent that drifts you away to paradise." Pikake ~ "Contains the sophisticated scent of the Pikake flower, a Hawaiian jasmine that Princess Kau'iulani called "the flower of love". Pikake's aroma of paradise is soft and sensual with a sophisticated blend of tropical florals and a hint of spice." Plumeria ~ "Contains the scent of beautiful, sweetly fragrant plumeria, the traditional flower of the Hawaiian lei, treasured for its exotic, uplifting aroma. Let the soft scent of plumeria transform your mind and body with all its complexities and hints of jasmine, citrus, gardenia and spices." Malie Organics perfume oils are available in 10 ml roll-on, $29 each. These sound like really nice pick-me-up tropical scents, and the price is right. But I seem to have less and less patience for perfume oils. sigh. Not my favorite format either. Why is that? I don’t have much experience with perfume oils. Seems like they might be better in a way cuz they last longer. I don’t have much experience with perfume oils either, mainly because most of those available seem to be “cheap” scents. I wish there were more available in higher end (read higher quality) perfumes, because the few I have tried do last much longer. My association with perfume oils is actually with indie lines – one of the ways I first started to learn more about fragrance in depth was when my LiveJournal friends were buying & reviewing a lot of Black Phoenix Alchemy Lab perfume oils and I was intrigued. Later on, I went on to purchase many perfume oils from the Sweet Anthem line – started by one of those LiveJournal friends! There are couple of Sweet Anthems that I LOVE and would wear a lot more often if I’d had the foresight to buy them in EDP instead of perfume oils… I really need to go back and buy some bottles from her soon. With the DSH purchases, I think I’m pretty much done with ever buying an oil again. Maybe. Because these Malies are super tempting. The only perfume oil I own is the Narciso Rodriguez For Her rollerball. I like it because its easy to carry around and it lasts quite nicely. But, the real reason I went for it is that this one just smells better on me than any of the others! I like perfume oils as a base for whatever I’ve sprayed on. Caveat, of course, is that it has to be something that works with what you spray on over it. Helps a lot with naturals and inexpensives that may or may not have great lasting power. Of course, like prestige makeup lines (anymore) cost is no gauantee of (pigment load) longevity. Oh my! I’m on Kaua’i right now. I have the Koke’e in a reed diffuser (it’s unique and lovely), and I’ve tried the Coconut Vanilla in lotion form (yummy!). The Plumeria reed diffuser is really wonderful, too. I’m SO glad you posted this, Robin. There’s no way that I’ll miss a stop at the Malie boutique. Thank you! I am! I’ll probably end up buying one, and I’ll ask about samples. Just for the general good. Someone has to do it. Hmm. Coconut vanilla + one of the florals sounds like a good combo. They aren’t expensive and they sound pretty good – i got curious by the mango and pikake one’s. Lovely box too! I have the body lotion which is lovely in terms of smell, texture and skin feel. Count me a brand fan.